Please see below for the 2019 schedule and sign up for classes using the calendar on the TRANSCAER® web-site at https://www.transcaer.com. 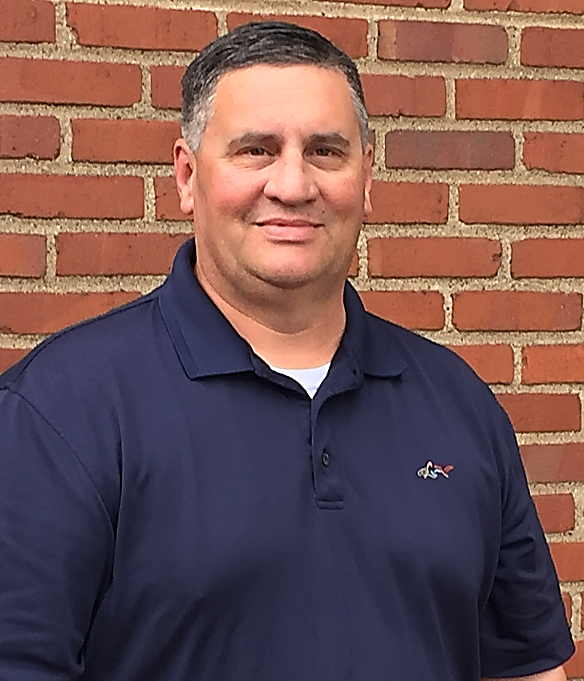 R. Scott Deutsch is Norfolk Southern’s Regional Manager of Hazardous Materials, responsible for all aspects of hazardous materials compliance, emergency responder training, emergency preparedness and response, and environmental cleanup and remediation activities across NS’ Northern Region. Norfolk Southern is fortunate to have Scott Deutsch on the HazMat team; stay tuned for the next NS OAR newsletter to meet another member! Two NS HazMat Team members recently received the TRANSCAER® Torch Award. The award is given to TRANSCAER® Team members who have actively dedicated a portion of their professional career to the TRANSCAER® mission, but are either retiring, leaving for a new job/industry, or are leaving the program due to another unforeseen situation. 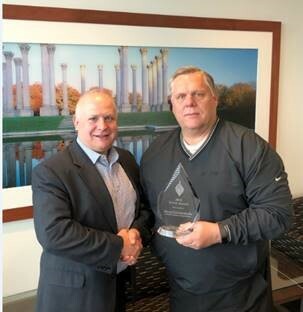 John Lerner received the award at his retirement dinner in Elkhart, IN and David Schoendorfer received the award from the Chairman at the March 2019 National TRANSCAER® meeting. The Norfolk Southern Safety Train spends the winter in Spencer, NC at the NC Transportation Museum, where Norfolk Southern personnel conduct routine maintenance and upgrades to prepare the Safety Train for its annual tour. Norfolk Southern kicked off the 2019 Safety Train campaign in unique fashion. 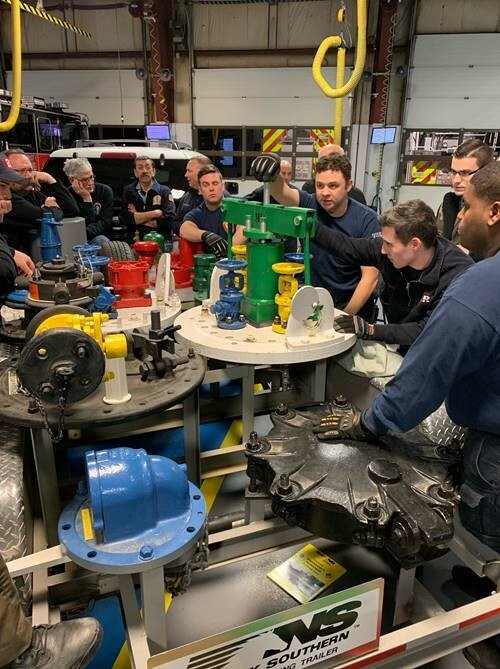 While the Norfolk Southern Safety Train is primarily dedicated to providing training to first responders, we seized the opportunity to provide advanced technician level training to our emergency response contractor personnel before embarking on the 23 stop tour. Norfolk Southern relies on the emergency response services provided by our network of contractors across our 19,500 miles of rail in 22 states. Making sure our contractor personnel our up to the task is of vital importance to Norfolk Southern and the communities we serve. Norfolk Southern conducted 3 days of comprehensive training to 45 students representing contractors from across our system. The training topics included tank car recognition, tank car emergency diagnostics, and tank car emergency response repairs and procedures. The training was capped off by a full scale response exercise. The scenario involved simultaneous problems involving multiple tank cars. The students put the training received during the class into action. This was the first contractor training workshop conducted by Norfolk Southern. Our hope to make this an ongoing program in conjunction with the Norfolk Southern Safety Train Tour. 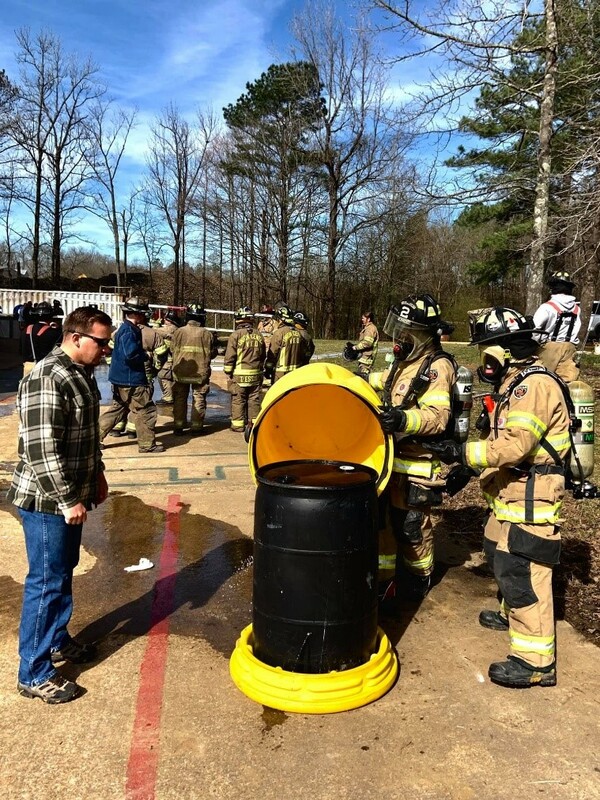 Norfolk Southern Hazardous Materials Officers offer and provide beneficial training to responders that serve their communities along the right of way. Both large and small communities that service our footprint need the same level of training to respond to incidents involving rail equipment and hazardous materials. 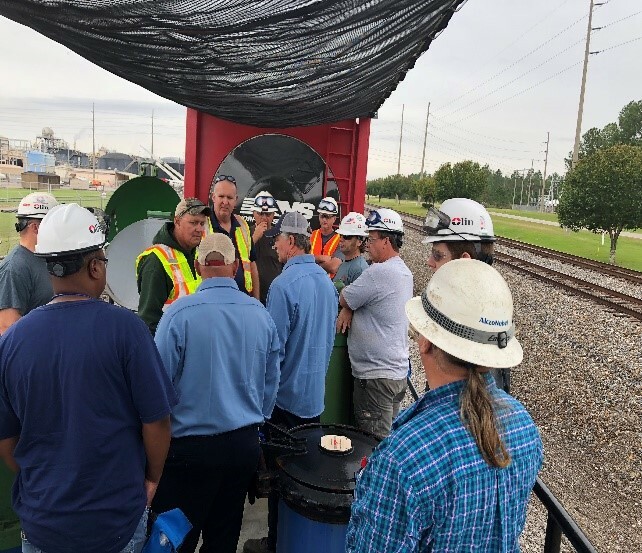 By providing this training Norfolk Southern solidifies a great working relationship with those communities so that if or when an incident occurs they have a name and face that they recognize that provides an integrated response. 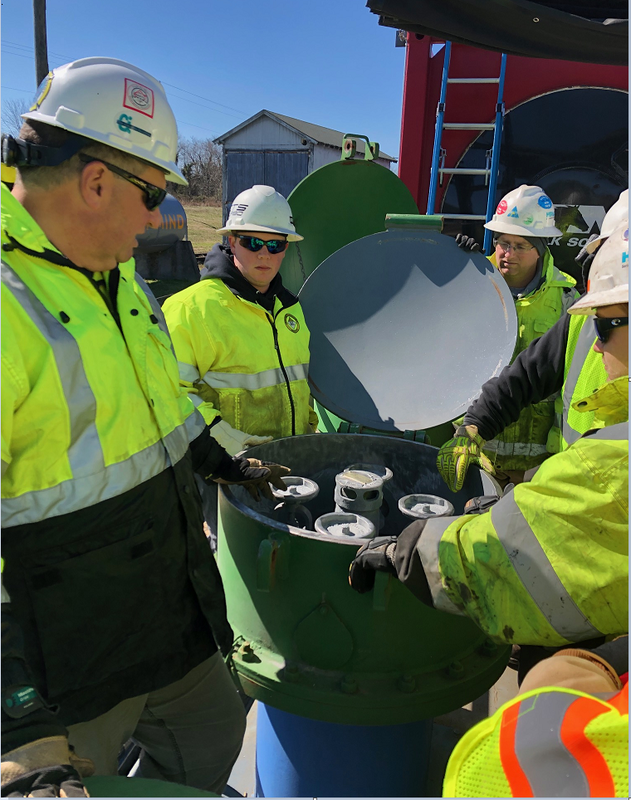 Training together provides working relationships so that when something happens responders will provide a vital and safe link to the Hazardous Materials Officers who will assist them in making decisions to protect their communities. On February 13th NS Hazmat Compliance officer Cris Burch and Regional Manager Scott Deutsch had the opportunity to train with Canadian Pacific and the United States Coast Guard. This was done in cooperation with TRANSCAER® and provided an excellent training event on Lake Michigan. The 8-hour training class reviewed the strategy and tactics of Environmental Emergency Response in waterways during freezing conditions (and it looks cold in this picture). The day started with classroom training held at the USCG facility in Milwaukee and was led by the CP’s Emergency Response Staff. Students received training on Cold and Frozen Water Oil Spills, Self-Rescue Techniques, Cold Weather Oil Spill Response PPE, Moving Ice - Spill Response Containment, Ice Characteristics, Surface and Subsurface Oil Removal, Source Containment Techniques, and Decontamination - Cold Weather Operations. Once the excellent classroom training was completed, it was off to Lake Michigan to start practicing hands on skills. 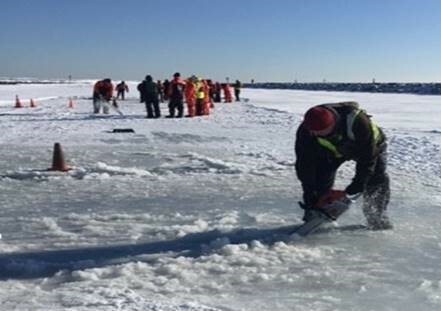 Some of these skills included: Ice Slotting – chainsaw use, diversion and collection; Ice Slotting – using a sled saw and trenching, and how to remove ice properly. The students had a great time trying out all of the equipment and learning these cold weather oil spill techniques. NS would like to thank CP and the USCG for a great training opportunity. This training will help NS in the Northern Region be better prepared for this type of incident. On February 5th , NS HazMat Compliance Officer taught a TRANSCAER® course at a local fire station in New Jersey. There were about thirty emergency responders in attendance. Some of them were firefighters who are attending their basic HazMat Technician class. Others were trained HazMat Technicians from the Franklin Township (NJ) HazMat team and the Somerset County (NJ) HazMat team. In February, Norfolk Southern worked with the VA Dept. of Emergency Management (VDEM) as part of a TRANSCAER initiative to sponsor rail oriented hands-on training for local emergency at the Portsmouth HAZMAT Station, in Portsmouth, VA. Norfolk Southern considers emergency preparedness education an essential element of responsible corporate citizenship, which in turn serves as a cornerstone to achieving sustainable business growth. Over 25 members of the Portsmouth HAZMAT team received training in responding to rail related hazardous materials incidents. 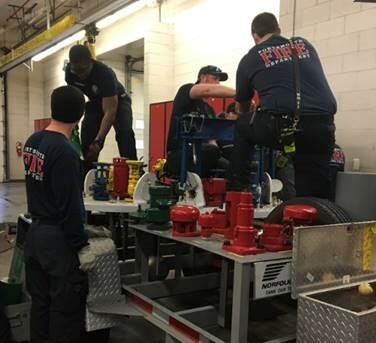 Using the trailer, the HAZMAT Team were trained on the function and use of the various valves and fittings found on tank cars, the most common sources of leaks, and the use of capping kits of pressure tank cars. Norfolk Southern's Hazardous Materials group publishes and frequently revises a Railroad Emergency Response Planning Guide. This Planning Guide is widely distributed to the emergency responder community during training events and is available on the OAR website. 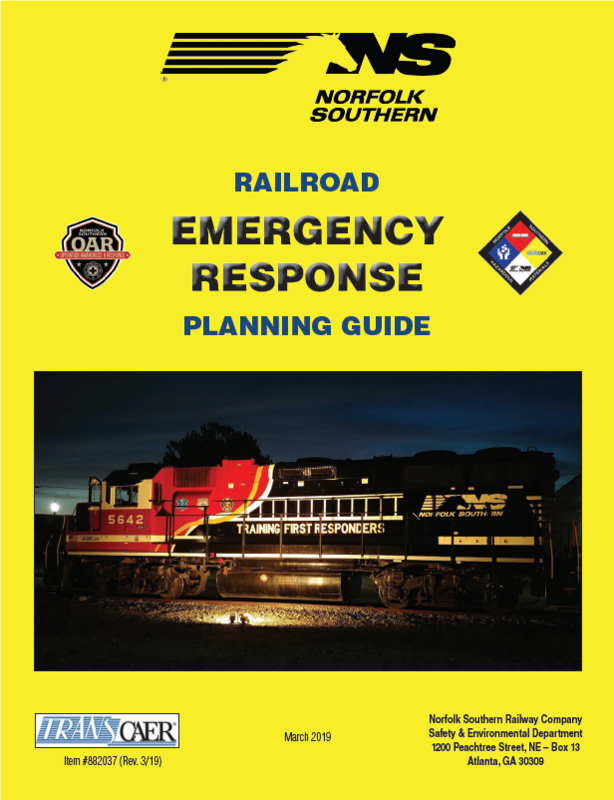 This Emergency Response Planning Guide can be used as an instructional tool and a reference guide to planning for and responding to emergency incidents on the railroad. The living document has information on prevention, preparedness, and response procedures related to railroad incidents. Additional information includes useful reference materials on rail car types, railroad hazardous material shipping papers, locomotive response, and website tool boxes.